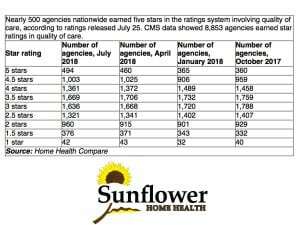 Sunflower Home Health is proud to announce that the 5-star rating earned this year places Sunflower Home Health’s in the top 5.5% of all agencies nationwide. CMS established the Home Health Compare (HHC) website on Medicare.gov as a key tool for consumers to use when choosing a home health care provider. It is designed to be an easy-to-access, convenient source of authoritative information on provider quality. The current methodology for calculating and reporting the star ratings incorporates a number of changes based on input received from stakeholders as well as ongoing data analysis.